This 40-year-old paper may contain the first suggestion that radicals are cellular messengers. later dubbed "redox-signaling" ), If anybody has anything earlier, please contact me at drp@drproctor.com. so I can give them proper credit. Other "lost" suggestions here are that homocysteine pathogenesis involves electron-transfer processes ( including oxidative stress ), that hyperuricemia involves oxidative stress, and that polyacetylenes such as melanin can be "doped" by charge-transfer agents (the proof of which won somebody else the 2000 Nobel Prize). Again, if this is wrong, please let me know. See Harman for a primary antecedent. For a later version of this review, go here. For more on homocysteine and redox signaling, go here. For more on homocysteine and altzheimers dementia go here, here and here . For more on doped polyacetylenes go here. In man, chronic elevated systemic levels of compounds possessing electron-transfer properties are typically associated with one or more of a triad of characteristic. signs. These are psychosis, dyskinesia, and abnormalities in pigmentation. The possible in vivo interactions of such compounds are discussed. While there is strong indirect evidence for biological factors in the etiology of the heterogeneous group of psychiatric disorders known as "schizophrenia (1-3) and also in the etiology of various movement disorders such as parkinsonism (4) no single etiological factor has as yet been well defined in either class- of disease. A step in this direction is the work of Cotzias et al. (5) reiterated by Curzon(4), -who noted an intriging correlation between the chronic presence of substances having electron-transfer properties, e.g., in phenothiazine treatment or manganese poisoning, and the appearance of movement disorders (dyskinesias) in man. It has been noted (6) that disorders associated, with the chronic presence of electron-transfer agents are also typically characterized by either or both of two additional symptoms- schizophrenaia-like psychosis or pigment . abnormalities. : The occurrence, significance, and possible etiology of such coincident signs in relation to the common electronic property of the compounds involved in their production are discussed. An electron -donor may be described as a substance which shares an electron ( or rather a statistical part of one ) in a -charge-transfer complex with an electron acceptor. Complete electron~transfer results. in a reduction~oxidation reaction, the electron donor being-oxidized and the electron acceptor being reduced.(7). A single-electron transfer often results in unpaired electrons on both the electron donor and the electron acceptor, both of which become free radicals.
. Column 4 provides an. empirical check on the electron-donor properties implied in column 3. 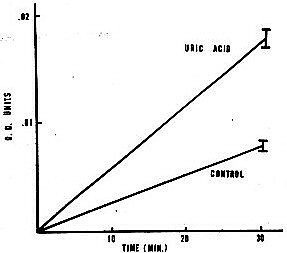 The classical colorimetric method for the clinical determination of uric acid is based upon the unique ability of that compound to directly reduce phosphotungstic acid (11). 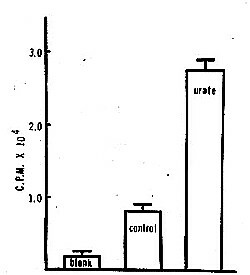 The similar electron-donor properties of L-dopa and its metabolites account for the artifactual rise in serum uric acid levels found with L-dopa therapy (12). Dr P sez: Speaking of "doping" of melanin. In 1974, we reported that melanin can act as a semiconductor " bistable switch ". That is, melanin is an " active device ", i.e., one whose electrical conductivity can be modulated by an electric field, such as in a transitor. Your computor is just an array of bistable switches. Three years later others reported that another polyacetylene can be chemically-modified to a similar high conductivity state by iodine. Note that " iodism " is listed in this review. They received the 2000 Noble Prize in Chemistry for this discovery. There is no evidence that the prize committee was aware of our earlier, more advanced work, though it was published in a major journal, Science. For more on this, go here. As noted, we also found that melanin can be doped chemically. Though clearly the Nobel committee differs, we considered this trivial. It was eight years before anyone else reported anything similar ( a field-effect transistor ) using a conductive organic polymer. Our "gadget" is now in the electrical collection of the Smithsonian as the putative first organic electronic device. Dr P note : Uric acid levels are correlated with risk of dying from heart attack . " Free radicals " have been postulated as a possible mechanism. "Cerovive" is the trademark of AstraZeneca for the stroke drug pbn disulfate. Keywords: parkinsonism parkinson's disease neuromalanin homocysteine melanin hemochromatosis free radical spin trap spin label melanin sharge transfer Lesch-Nyhan bromism iodism wilson's disease manganism inflammation neurofibrillary tangles fibrosis prostaglandin superoxid dismutase sod superoxide hydrogen peroxide hydroxy radical reactive ozygen species etiology copper transition series metal redox signaling cytokine nkbeta amorphous semiconductor organic ros threshold switching electronic nitric oxide peroxynitrite properties antioxidant proxidant oxidant oxidation reduction cancer altzheimer's disease senile dementia pbn tempol tempo dmpo nxy-059 nitrone nitroxide. drug treatment polyacetylene human diabetes proxidant vitamin c ascorbate vitamin E deafness deaf phenothiazine pigmentary abnormalities albino ototoxic drug aminoglycoside waardenberg cis-platinum adriamycin bleomycin messenger uric acid urate iron manganese iodide dalmatian ataxia dyskinesia psychosis organic metals schizophrenia dementia vascular stria vascularis substantia nigra midbrain basil ganglia locus ceruleus pigmented stroke reperfusion injury fenton's reaction cytochrome c nitric oxide reduction oxidiation myocardial infarction mi mitochondria organic metal catalase glutathione peroxidase transmission neurotransmission.inner ear lung platelet interstitial ards dad pulmonary edema asbestosis asbestos cardiac atherosclerosis heart homocystinuria active oxygen autoxidation autooxidation. Schizophrenia parkinsonism parkinson's disease neuromalanin melanin hemochromatosis free radical spin trap spin label melanin sharge transfer Lesch-Nyhan bromism iodism wilson's disease conductive polymer polymers copper manganism inflammation neurofibrillary tangles fibrosis prostaglandin superoxide dismutase sod superoxide hydrogen ros metabilic syndrome x insulin urc acid. peroxide hydroxy radical reactive ozygen species etiology copper transition series metal redox signaling cytokine nkbeta amorphous semiconductor organic threshold switching electronic properties organic metals metal antioxidant proxidant oxidant oxidation reduction homocystinuria atherosclerosis homocysteine thiolactone..
cancer altzheimer's disease senile dementia pbn tempol tempo dmpo nxy-059 nitrone nitroxide drug treatment polyacetylene human diabetes proxidant vitamin c ascorbate vitamin E deafness deaf phenothiazine pigmentary abnormalities albino ototoxic hair loss alopecia homocysteine aminoglycoside cis-platinum adriamycin bleomycin nxy-059 astrazeneca messenger uric acid urate iron manganese iodide dalmatian ataxia dyskinesia psychosis schizophrenia dementia vascular stria vascularis substantia nigra midbrain basil ganglia locus ceruleus pigmented stroke reperfusion injury nitric oxide myocardia infarction mitochondria pathogenesis free radical.